Keepers Favorites come in both flat collar styles and hidden prong styles. If you're looking for a Keeper's Favorites Flat Collar, you can view the collections here. Just select your preferred collar width (Based on the width of the webbing that makes up the core of the collar) and browse that collection for a design that you like. 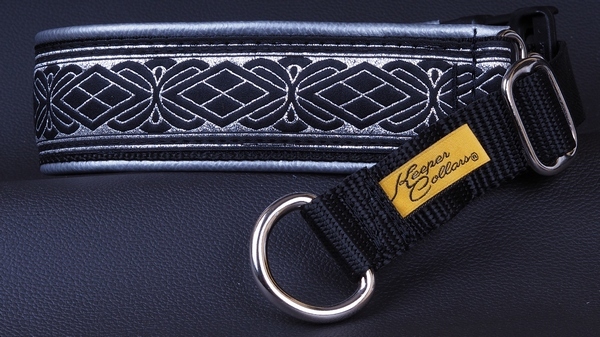 Click on the links below to view to our collections of Keeper's Favorites Hidden Prong collars. Click on the link below to go to our selection of Hidden Prong Favorites made using 3/4" wide webbing. Click on the link below to go to our selection of Hidden Prong Favorites made using 1" wide webbing and brass hardware. Click on the link below to go to our selection of Hidden Prong Favorites made using 1" wide webbing and chrome hardware. Click on the link below to go to our selection of Hidden Prong Favorites made using 1 1/2" wide webbing.